from rabid insane leftists who should be institutionalized? hit 'em with a couple of tranquilizer darts, lock 'em away in a padded cell and let's get back to making america great again! Last edited by ok doser; January 22nd, 2019 at 12:14 AM. Jews tend to get off the hook on what they say or do by simply revealing they are Jews. That's why 30 million people in this country claim to be one even though there's only like 5 million. It's a 'get out of scrutiny' card. Probably served him well in his lawyer days. wonder why the msm didn't think of that? The incident at the Lincoln Memorial was more complicated than it initially seemed, but new footage doesn’t exonerate the kids in the red caps. 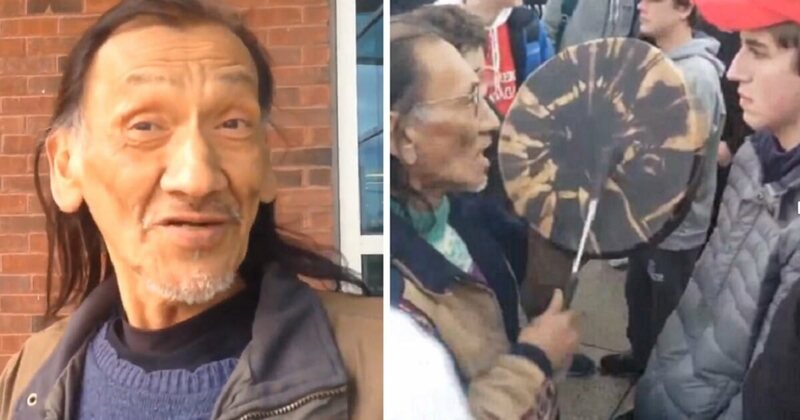 in the face of a Native American man who was beating a traditional drum. —in order to defuse tension between them and some noisy and vulgar street preachers nearby. Longer videos emerged that showed the street preachers—who belong to a fringe religious group called the Black Hebrew Israelites that the Southern Poverty Law Center once described as “[o]bsessed with hatred for whites and Jews”—shouting insults at both the boys and the Native group. Meanwhile, no footage has emerged that shows the teens shouting “Build the wall,” as Phillips and other witnesses have said they did. and the new accounts certainly chip away at the straightforward narrative of a MAGA teen going out of his way to taunt a Native demonstrator. I still don’t—or at least not completely. Most accounts, including mine, made no claim that Sandmann first approached Phillips. including those most inclined to be sympathetic to him. The boy’s school and its Catholic diocese quickly issued an apology. and his failure to get out of Phillips’s face. meaning they vastly outnumbered both groups of antagonists. some can be seen doing the “tomahawk chop,” a controversial gesture that originated in sports fandom (rather than Native culture) and is considered offensive by some. There’s no mistaking the core dynamics of the encounter: Sandmann smugly grins in Phillips’s face and declines to step backward, and he’s backed by dozens of boisterous teens who are jeering and mocking the much smaller group of Native marchers. None of this might have mattered—and the clip certainly would not have gone viral—if Sandmann and many of his peers were not wearing red Make America Great Again hats. Boston Globe columnist Renée Graham wrote last summer about seeing more than a dozen white teenage boys in MAGA hats at the National Museum of African American History & Culture. “Clearly, this was meant as a provocation,” she wrote. especially when the bill of that hat is inches from the nose of a Native American. The new facts about this small encounter this weekend in Washington are important, and worth clarifying. and it’s the media’s responsibility to describe it accurately (once we’ve decided to describe it at all). The climate includes a president whose name is used as a taunt by school bullies and racist harassers, who wields the rhetoric of domestic violence to cause pain and then blame those who are suffering, who delights in teasing and threatening his enemies, and who just last week made a joke about a government massacre of Native Americans. It would be a mistake to let our preexisting views persuade us to see something in this particular video that isn’t there. But it would also be misguided to let the complexities of the scene at the Lincoln Memorial dissuade us from telling the truth about who Trump is and exactly what he stands for.